Based on BCG’s proprietary LNG market model. LNG demand finally began growing again in 2016, after four years of stagnant consumption stemming from high market prices (from 2011 to the end of 2013) and a challenging supply environment. However, a significant amount of LNG supply—more than 50 billion cubic meters per annum (bcma)—came online during 2016. This supply growth is outstripping demand requirements, preventing a rebound in LNG prices (which began to decline in 2014) and squeezing industry margins. 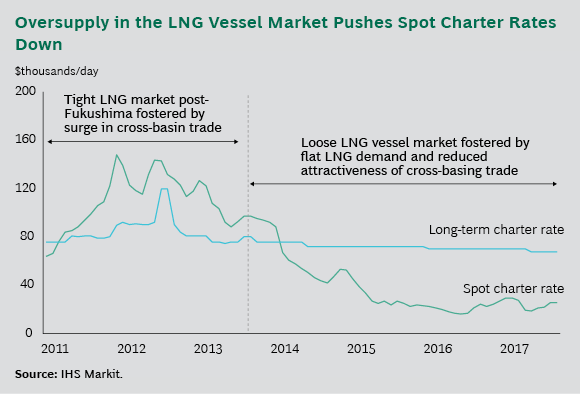 This margin squeeze from excess supply, which is likely to persist until at least 2020, is further amplified by excess supply in the LNG vessel market. While LNG suppliers may be locked into long-term shipping contracts, LNG buyers are asking for contracts that reflect the lower spot charter rates. Meanwhile, new sources of demand growth are creating additional challenges. Beyond China and India, where consumption increased by roughly 20% in 2016, significant demand growth is coming from so-called niche markets, such as Egypt and Pakistan. Contracts in these markets are typically higher risk and for lower volumes and shorter periods than contracts in more established markets. As a result, it is difficult to leverage the demand from niche markets to finance new liquefaction projects. In response to these shifting market dynamics, suppliers must take action in three areas. First, they must focus increasingly on managing costs, developing only those projects that are competitive under current pricing and implementing structural cost-saving measures, such as standardized, modular approaches to plant construction. Second, they must develop sophisticated sales and trading strategies to address the needs of emerging buyers and improve their risk management processes as smaller, higher-risk contracts become more prevalent. Third, they need to consider selective downstream investments that could support the development of new markets. Such moves will allow them to lock in demand and achieve higher LNG prices by means of vertical integration. We therefore expect a healthy 1.5% compound annual growth rate in natural gas demand between 2015 and 2025. Even under a scenario of challenging conditions for growth—with renewables taking off extremely rapidly in the years ahead, for example—natural gas demand will continue to expand at an annual rate of at least 0.5%. Within the natural gas market, LNG demand growth has been particularly robust. From 1990 through 2016, LNG demand grew at an annualized rate of 6%, compared with 2.3% for natural gas. However, there are significant changes in store for the LNG market, driven by the expected short-term supply-demand imbalance and the increased importance of niche markets. The LNG market, which now stands at about 350 bcma, or roughly 10% of the total natural gas market, will face significant challenges owing to oversupply for the next three to five years. To understand why, it is important to assess the trajectory of both demand and supply. LNG Demand—a Return to Growth. LNG demand growth has been a bit of a roller coaster. From 1990 to 2011, demand soared from about 72 bcm to 327 bcm—an 8% annual growth rate. Then, from 2011 to 2015, consumption was flat, owing to high LNG prices during much of that period and limited supply. As noted earlier, growth picked up again in 2016, thanks to demand from markets like China and India as well as from new niche markets. We expect demand to continue this upward trajectory, increasing 5.3% per year under our base scenario, from 332 bcm in 2015 to 559 bcm in 2025. As noted in last year’s report, our demand projections are subject to significant uncertainties stemming from four factors. First, a country’s demand for energy is heavily dependent on its economic growth—something that cannot be predicted with precision. Second, a country’s energy policies can shift over time. For example, the amount of nuclear capacity restored in Japan or the limits on coal use imposed in China could have a significant impact on our estimates. Third, the competitiveness of LNG compared with that of alternative fuels is hardly static. In Europe, for example, changes in coal and carbon dioxide prices will determine the competitiveness of gas in the power industry, and thus the LNG volumes that power plants will ultimately consume. Finally, the development of alternative sources of natural gas is difficult to predict—a larger than expected increase of either domestic gas production or pipeline imports in China, for example, would reduce LNG demand in that country. Japan, South Korea, and Taiwan. We reduced the base LNG demand forecast for 2025 from 184 bcm to 166 bcm because of an expected increase in competition from other sources (mainly nuclear and coal). Europe. We increased the base LNG demand forecast for 2025 from 80 bcm to 95 bcm because of the anticipated larger role of natural gas in the energy mix, driven by 2015 UN Climate Change Conference (COP 21) targets and a growing role for LNG in the natural gas supply. China and India. We reduced the base LNG demand forecast for 2025 from 142 bcm to 133 bcm because of lower forecasted energy demand overall, stemming from downward revisions of GDP estimates. Southeast Asia. We reduced the base LNG demand forecast for 2025 from 92 bcm to 81 bcm because of a slightly larger than expected role for coal in power generation. Niche Markets. We increased the base LNG demand forecast for 2025 from 73 bcm to 83 bcm because we expect that continued low prices and renewed interest in market development from select suppliers will further foster consumption in this segment. Rapidly Expanding Supply. The current LNG market is marked by the largest supply increase in its history. Fourteen projects are expected to become operational between 2016 and 2020.2 These projects have a combined capacity of roughly 200 bcma—about 45% of global supply in 2015. Additional projects representing a total of about 270 bcma have been proposed but have yet to secure a final investment decision (FID). However, as we noted last year, most of these projects are unlikely to materialize given persistently low LNG prices. Only one brownfield project, Tangguh Train 5 in Indonesia, secured an FID in 2016. However, there are producers able to secure an FID even in this low price environment. The new LNG project announced by Qatar is likely to move ahead given the low cost of production in that country. Ultimately, the number of projects currently without FIDs that actually come to fruition will depend on the industry’s adoption of measures that lower project costs. Base Scenario. Supply capacity hits 585 bcma in 2019 and 644 bcma in 2025. This scenario assumes a one-year delay in the launch of 9 of the less advanced 14 projects with FIDs, plus about 50 bcma coming online before 2025 from the new capacity being developed in Qatar and from additional projects currently without FIDs. Low Scenario. Supply capacity hits 520 bcma in 2019 and 592 bcma in 2025. This assumes a two-year delay in those same 9 projects and no additional capacity coming online from projects currently without FIDs. High Scenario. Supply capacity hits 640 bcma in 2019 and 671 bcma in 2025. This scenario assumes no delays in projects that currently have FIDs, plus about 80 bcma coming online before 2025 from the new capacity being developed in Qatar and from additional projects currently without FIDs. The Bottom Line Outlook. Strong supply growth will result in oversupply in 2019 under seven of nine of our projected supply and demand scenarios. (See Exhibit 2.) Oversupply will contribute to increasing liquidity in the LNG market. Spot and short-term volumes of LNG have been rising steadily and significantly, climbing from 25 bcm in 2005 to about 100 bcm in 2015. This growth is expected to continue, with volume in 2025 exceeding 200 bcm. The projects are AP LNG T1/T2, S. Pass T1-T5, Gorgon LNG, MLNG Train 9, Kanowit, Wheatstone, Ichthys, Prelude FLNG, Yamal, Freeport T1-T3, Cameron T1-T3, Cove Point, Corpus Christi LNG T1/T2, and Tangguh T3. This rising liquidity is bad news for LNG marketing margins. Highly liquid markets, including the US and the Northwest European natural gas markets, have historically had very low marketing margins. The LNG market, however, has long boasted high marketing margins—but as liquidity increases, those margins will contract. The Specter of Contract Renegotiations. Suppliers with broad portfolios will likely actively curtail the amount of LNG that they produce—even if their production costs are below the level of spot prices. That’s because they will want to keep spot prices from going so low that they trigger a wave of calls by long-term customers to renegotiate existing contracts. However, suppliers won’t be able to sufficiently adjust production to fully offset the excess supply (about 90 bcma) expected under our base scenario. A Pullback in Supply Because of the Economics of Certain Contracts. In the sizable US market, facilities will curtail production if spot prices reach a level that is financially disadvantageous to off-takers (buyers who are committed to purchasing certain volumes). This situation can arise because of the nature of the contracts that underpin these liquefaction projects. Contracts between off-takers and liquefaction “tollers” (infrastructure companies that own liquefaction facilities in the US) give off-takers the right, but not the obligation, to off-take certain volumes of LNG. The contracts do, however, oblige off-takers to pay a tolling fee regardless of whether or not they off-take the stipulated amounts. In situations where spot prices are such that off-takers would incur a loss greater than the tolling fee—that is, when spot prices for LNG delivered ex-ship are less than 115% of Henry Hub prices plus transportation costs—off-takers will likely decline to purchase the agreed-upon volume and instead just pay the tolling fee. In such cases, these facilities will curtail production of LNG. The Tipping Point with Coal. LNG demand could see a strong boost in Europe, and ultimately globally, if LNG spot prices fall to or below the level at which gas can compete effectively against coal given their marginal costs. This would occur if LNG spot prices fall to about $4.6 million per BTU in Europe, assuming a carbon price of $25 per ton and a coal price of $45 per ton. In Western Europe alone, up to 160 bcma of additional demand could be triggered by the substitution of gas for coal. Until recently, historically large and developed markets, including Europe, Japan, and South Korea, accounted for the bulk of LNG demand and growth. These markets have low credit risk and typically can be served through traditional long-term contracts involving volumes of more than 1 bcma. During the past decade, however, new markets have become a major driver of demand. The number of countries importing LNG grew from 9 in 1990 to 31 in 2015. In particular, five nascent markets—Egypt, Pakistan, Jordan, Lithuania, and Poland—grew substantially from 2014 through 2016. New demand from these countries reached nearly 19 bcma in 2016, equivalent to the total combined demand of Spain and Italy. This trend is expected to continue, with a number of other countries potentially beginning to import LNG by 2025. Among the possible new markets: Bangladesh, the Philippines, Malaysia, Indonesia, Bahrain, Panama, Uruguay, Colombia, the Caribbean region, Morocco, and South Africa. LNG tanker fleet capacity increased 24% from 2011 to 2015—from 51.9 million cubic meters to 64.4 million cubic meters—new construction sparked in part by the spike in LNG demand that followed the Fukushima disaster. Many of these vessels were not tied to long-term contracts but rather were ordered mainly to capture cross-basin price differentials in LNG vessel shipping rates. This pressure on prices is unlikely to abate anytime soon. There are orders on the books for significant numbers of additional LNG vessels, construction that we predict will push total capacity to 80 million cubic meters at the end of 2020. This surge in capacity will have two major repercussions. First, there will be pressure to retire older vessels with higher operating costs. The new vessels tend to have 40% to 50% lower energy consumption per transported cubic meter. And they are faster, reducing shipping time by roughly 5% on longer routes. Second, LNG producers will face further margin pressure as buyers demand LNG contracts that reflect the lower spot prices for vessels, while suppliers are still locked into older, higher-cost vessel contracts. The shifts in the LNG market—particularly oversupply and the development of new, higher-risk markets—require new thinking. LNG players should take action in three areas. Reduce costs. As noted in last year’s report, some suppliers are reducing the costs of new LNG projects. In the past, where LNG supply was tight, suppliers focused on project execution, not cost management. In fact, the costs of new projects have been rising significantly since 2011; new-project costs jumped from $500 million per million tons of capacity before 2011 to $1.5 billion today. In light of the current low LNG prices, however, many planned projects are not competitive, and companies must take steps to address the cost issues. They should focus on only the most competitive potential projects, postponing those with very high costs. In addition, they should move aggressively to reduce development costs, such as by adopting standardized manufacturing approaches, encouraging greater competition among suppliers, and implementing lean approaches throughout the development process. Invest in sales and trading capabilities. Some LNG suppliers are developing sophisticated sales and trading strategies that enable them to manage their business in the smaller, fast-growing niche markets. About 50% of the total volume sold by international oil and gas companies is now marketed through portfolio sales rather than traditional point-to-point sales.3 In addition, they are upping their game in risk management. The combination of higher counterparty risk and continuous trading activity in the spot LNG market requires ongoing monitoring of commodity and counterparty risks by suppliers. Develop new markets. LNG suppliers should focus on new-market development, primarily through investment in downstream facilities. In an environment of significant LNG oversupply, many suppliers are now willing to support the creation of new markets that can absorb part of their volumes with competitive prices. This strategy has been used in the Chilean market and more recently in a project announced in Ivory Coast. The degree to which LNG suppliers are embracing these strategies varies. It will be critical for them to assess which can help them thrive in a difficult environment. A point-to-point sale is a contract under which LNG is purchased from one specific location and delivered to another specific location. In a portfolio sale, the source of the LNG is not predetermined, giving the supplier flexibility in fulfilling the contract. LNG suppliers should be prepared for a bearish market over the next several years. We expect substantial oversupply, driven by the 190 bcma of additional capacity projected to come online in the next three to five years. That oversupply will keep LNG spot prices at low levels and put pressure on industry margins, while increased liquidity in the market will squeeze marketing margins. In this challenging environment, the industry will need to assume bigger risks, with shorter and smaller contracts with buyers in niche markets. Suppliers will need to up their game in risk management while also moving aggressively to reduce development costs for new projects in order to ensure that they are economically viable. This is the second in a series of annual reports on the evolving LNG market. Each report analyzes the supply-demand environment using BCG’s proprietary LNG market model and discusses issues relevant to the industry.